Some seasons especially the winter season can seem longer than others. I remember feeling like winter would never end when I lived in Central Asia. Here I only have two seasons-rainy and dry, but it often seems like rainy season goes on forever. Lucky for me, I am in dry season and enjoying it. So why am I doing a post on keeping sane? 1) Modern Ms Darcy is having a link up about what is keeping us sane. 2) Being sane is a year long process. Hopefully some of the habits from this season will get me through the next also. How are you taking care of yourself especially your soul? Most mornings I read at least one Psalm to start my day. The Psalms are great reminders of who God is. I come away with a high view of God and a more accurate view of myself. The Psalms are a great way to begin my prayer time giving words of adoration but ways for me to pray for myself and my family. This practice keeps me mentally sound. Some mornings I read the Psalm and spend time sitting and savoring the words. Other mornings I dig in a bit more by either using one of the studies from SheReadsTruth like this or this. I also find The Wiersbe Bible Study Series: Psalms: Glorifying God for Who He is by Warren W. Wiersbe helpful for background information on certain Psalms. I walk three days a week with a friend which allows us to stay connected with each other. 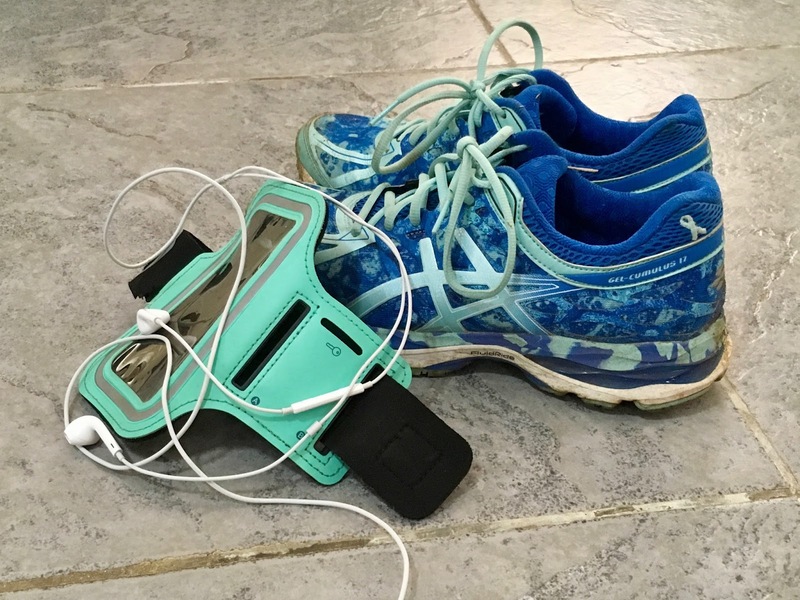 For the past month or so, I started using two of the other days to try out running again. At first, I would run/walk/run/walk. Now I am able to run most of my route but still walk for a few yards in the middle if my heart rate is getting into the peak zone. I will not being running a marathon or even a 5K anytime soon, but I love how I feel after a run. Running used to be a big part of my life, and I enjoy having it back even if it is on a small scale. According to my fit bit on the days that I run, I sleep 19 more minutes at night. Who couldn't use more sleep? Besides running, stretching is more a part of my morning exercise. As I grow older, my body gets creakier. I usually do a few yoga poses and simple stretches and if I have time some sit ups or push ups. It is not a lot but enough to make me feel more limber for the day. The stretching has also helped my hip which can be a pain in my side (literally) some days be less stiff. These practices are helping me keep healthy in body. Our family subscribed to Apple Music a few years ago after trying it out for a free trial period. Big D loves music so this is a gift that keeps on giving. 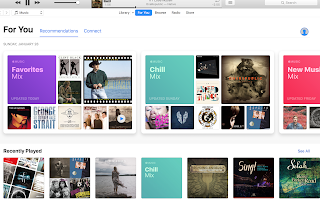 He can keep up with all the new music plus have his old favorites. For a bit more, the whole family is able to get in on the fun. In the past due to slow internet, I only downloaded a few albums here and there. Now we have faster internet, and I am loving getting to stream music. 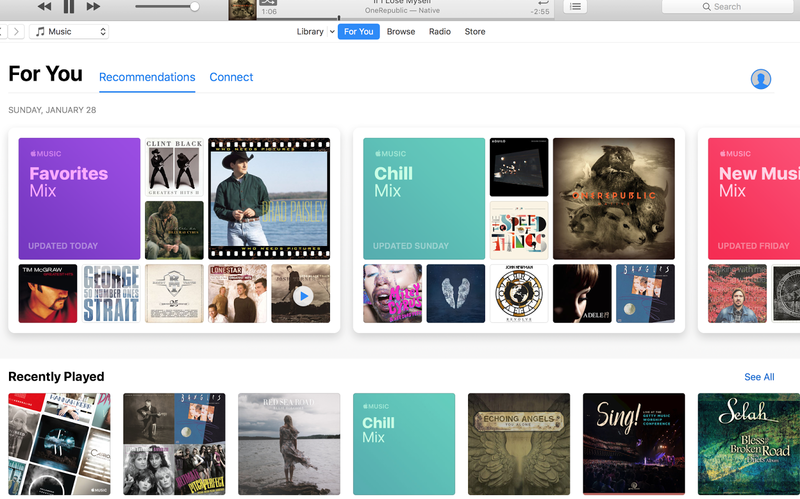 I especially love the For You section where Apple makes up playlists based on my music tastes or I can choose from other ready made playlists. Music always seems to make life better and can be tailored to fit any mood. Back in November, I listened to a podcast from The Next Right Thing. In it, Emily takes about how we need to voice what we want so we can see what our expectations are. By naming them, we can either give them back to God if they are not in his will or we can figure out a way to make it happen. 2. I wanted to make some from memories while they are here. To make this happen, I planned ahead. What could I make for menus? What could we do? What should W bring in? This gave me margin while they were here. Then I had to be intentional about making time to have conversations and make those connections. We didn’t always stick with the plan which is okay but it is easier to modify a plan than to come up with a whole new one. I enjoyed my time playing ping pong with Big D, walking along the beach with mom, and swimming with W. We watched way too many movies, ate too much sugar, and laughed as we played games. There were glitches but that is life. But I felt like I was able to focus on the important things-connecting and just enjoying my family. Now I am looking at the summer. Big D and I will be in the states for June and July. What do I want out of that time? What is a reasonable expectation? What is not? What does God have for us? Hopefully this will give me a framework as I pray and think ahead knowing that all plans can change in an instant. So as I look at new situations and opportunities, I am doing a better job of thinking through what I want and what this new thing will entail and require of me. It helps me see the expectations I have about the situation but also the expectations of others. This is something little that adds a smile to my face as I journal. 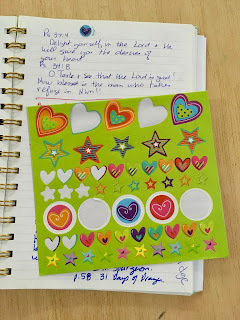 I have some extra stickers from a friend that are finding their way into my journal and even my bible. What is keeping you sane or saving your life right now? I would love to hear about it in the comments. I collected stickers as a kid....yes total 80's kid and still love to use them on envelopes, in my planner, wherever I can. TJ - I am resonating with your sanity producers - the Psalms, walking, music. And stickers! Yes, I like stickers!